Photos from players' respective Twitter accounts. Just days after the conclusion of the most successful season in program history, the UCF football team has already landed two big transfers. With UCF’s 34-27 upset win over Auburn in the Peach Bowl on New Year’s Day, the Frost Era has officially ended and new coach Josh Heupel and his staff have officially taken the reigns with no signs of trouble when it comes to landing some key prospects early. 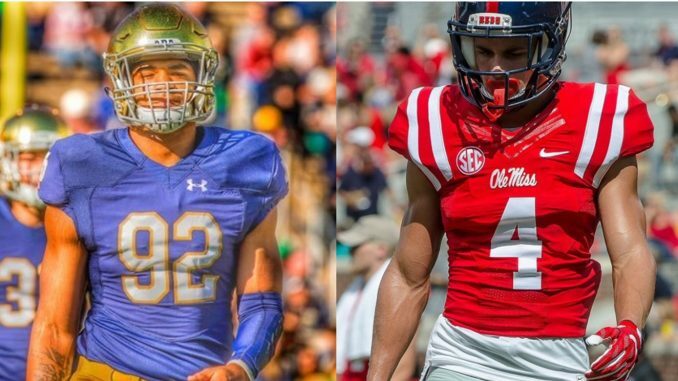 Former freshman defensive end Jonathon MacCollister joins the Knights from Notre Dame, as well as redshirt freshman wide receiver Tre Nixon from Ole Miss. Both MacCollister and Nixon attended high school in Florida and have now made the decision to come home. At 6-foot-3, 233 pounds, Jonathon MacCollister a former defensive end, is now the newest addition to the Knights’ offense. MacCollister announced via Twitter this past weekend that he will be leaving the Fighting Irish in South Bend and transferring to play in his hometown of Orlando for the Knights, but instead of playing on the d-line, will instead play as a tight end. In his freshman year at Notre Dame, MacCollister did not see the field. A 3-star recruit out of Bishop Moore High School in Orlando, his senior year he had 42 tackles, seven of which were for a loss, five sacks, two forced fumbles and two fumble recoveries. In addition to his impact defensively, he also had 21 catches for 209 yards and two touchdowns as a tight end. After UCF star tight end Jordan Akins declared for the NFL draft this past weekend, the now-open tight end spot on the Knights’ roster gives MaCollister a great opportunity to eventually make an impact on the offensive side of things for UCF. Per NCAA transfer rules, MacCollister will have to sit out a season before stepping on the field for UCF. UCFast may have just gotten even faster with the addition of former Ole Miss wide receiver Tre Nixon. At 6-foot-1, 170 pounds, Nixon announced via Twitter that he will join this Knights’ squad. Nixon redshirted his freshman year at Ole Miss and this past season appeared in ten games with one 19- yard catch. A 4-star recruit out of Viera High School, which is about an hour away from the UCF campus, Nixon had 79 catches for a total 1,243 yards and 18 touchdowns his senior year. In addition, he helped lead his team to the FHSAA Class 7A State Championship Game for the first time in school history, before falling to powerhouse St. Thomas Aquinas. According to reports, Nixon has obtained the help of an attorney to help him through the transferring process and to hopefully prevent him from sitting out a year. While Nixon was still at Ole Miss, the program was investigated for failing to meet the NCAA’s standards when it came to recruitment and faced serious repercussions. The investigative body eventually ruled that rising seniors in the program could transfer without having to sit out a year, but Nixon will only be a redshirt sophomore next season. With UCF’s number one reciever Tre’Quan Smith declaring for the NFL Draft this past weekend, the time is now for Nixon. If granted eligibility to play this season, Heupel and his staff could have a new weapon right from the start. In fact, Nixon even sported the same number four, that Tre’Quan was so well known for wearing, while at Ole Miss.